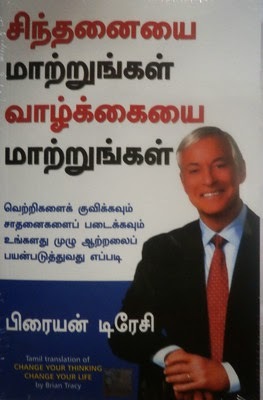 Brian Tracy’s Change Your Thinking Change Your Life is translated to Tamil and published by Manjul Publishing House Pvt. Ltd.
Brian Tracy shares his ideas, thoughts and wisdom about leading a better and more fulfilling life. The book discusses how to unlock your full potential for success and achievement. The author shares a large number of practical tips, techniques and tricks to increase one’s own potential, eventually leading to more success. He explains how our inner resources can be harnessed in a way to live our lives fully and excel in every sphere of life. These techniques can be adopted in our day-to-day life. Brian Tracy was born in Canada. He is a professional and motivational public speaker, author, business coach, keynote speaker, and entrepreneur. He ran for Governor in California Gubernatorial Recall Election in the year 2003. He is also a member of the Heritage Foundation board of trustees. Some of the books authored by Brian Tracy are Maximum Achievement: Strategies and Skills That Will Unlock Your Hidden Powers to Succeed, Advanced Selling Strategies: The Proven System of Sales Ideas, Methods, and Techniques Used by Top Salespeople Everywhere, The 21 Success Secrets of Self-Made Millionaires: How to Achieve Financial Independence Faster and Easier Than You Ever Thought Possible, Victory! : Applying the Proven Principles of Military Strategy to Achieve Success in Your Business and Personal Life and Getting Rich Your Own Way: Achieve All Your Financial Goals Faster Than You Ever Thought Possible.